Little Capri (g. by O'Lonhro). 4 wins to 1150m, A$75,755, to 2018-19, 2d BRC Coca Cola Amatil P., MVRC Quest H., 3d MRC Ladbrokes Live Play H.
Spirit of Capri. 11 wins to 1550m, A$188,130, SAJC Challenge Series Final, Tulloch H., Gray Management Group H., Distinctive Homes H.-twice, 2d SAJC Medallion Homes H., Allan Scott Morphettville H., Neil Sachse Foundation H., Super Saturday April H., 3d SAJC Allan Scott Park Morphettville H., Come to Allan Scott Park H., Allan Scott Park Morphettville Flying H., Book for the Melbourne Cup H.
Rose of Capri. Winner at 1400m in Aust. Satin Crest. Winner at 1200m in Aust. Tsigane's Lad. Winner at 850m in Aust. Mi Kerida. Winner at 1000m, 3d MRC Cardinia 2YO H.
Bird of Capri. 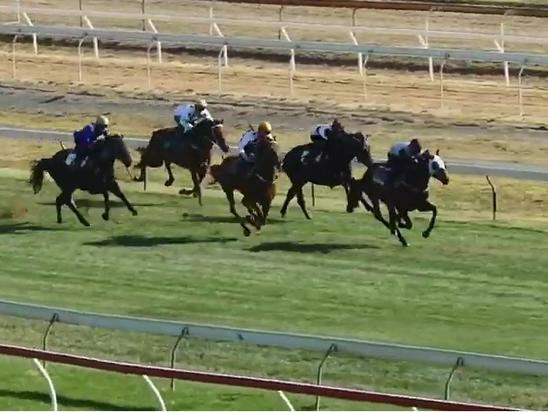 Winner at 1200m, 2d MVRC Camp Australia H., 3d VATC Springvale H.
Shaw Will - Absolute Maverick (Sing.). 4 wins to 1350m in Aust. and Malaysia. Blue Valour. 3 wins at 1300m in 2017-18 in Aust. Go Faraglioni. 2 wins at 1750m, 2100m in Aust. Caesar's Secret. Winner at 1050m in Aust. Angel of Capri. Winner. See above. Blue Capri (Proven Valour). 5 wins. See above. Blue God. 5 wins from 1000m to 2200m in Aust. Blue Valour. 4 wins-2 at 2-to 1100m, 3d VRC Misting H.
Blue Hawk. 2 wins at 1100m in Aust. Mighty Mirage. 6 wins to 1150m, A$91,050, 2d VRC City Racing at Werribee Sprint H., MVRC Andale Beer Dispensing Equipment 2YO P., 3d MVRC Carlton Draught 2YO H., VRC & Werribee RC H., MRC Grange H.
Blue Grotto. 11 wins. See above. Millritz. 5 wins from 1200m to 1600m in Aust. Star Cove. 4 wins from 1600m to 2050m in Aust. Bucci. Winner at 1900m in Aust. Glory to Glory. Winner at 1400m, 2d AJC La Perouse H.
Trisson. Winner at 1250m in Aust. Charming Gem. Winner. See above. Swift Cove. 6 wins to 1400m, 2d BTC TMP Worldwide H.
Tricia's Cove. 3 wins at 1400m in Aust. Beauquest. 2 wins at 1050m, 1200m in Aust. Cape Petrel. 10 wins from 1100m to 2000m in Aust. Mindle Beach. 5 wins to 1300m in Aust. Beretta. 2 wins at 1000m, 1050m in Aust. Aqua Vari. Winner at 1000m in Aust.